To do: Create a history section, and add a spoiler tag. Also, elaborate further on its personality. "Ship" redirects here. For other uses, see ship (disambiguation). The Hocotate ship (ドルフィン初号機?, lit. 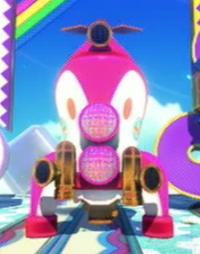 : "S.S. Dolphin first model") (usually called simply the ship) refers to Olimar's new rocket in Pikmin 2. It is the President's ship and the first ship Hocotate Freight had, being part of the company since it's very beginnings. 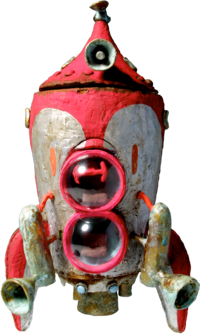 Unlike the S.S. Dolphin, the Hocotate ship is capable of speech, (replacing most of Olimar's in-game speech), and takes on the role of giving advice throughout the game. Olimar makes his opinion of its personality being pompous and quirky known in his notes. It sports two cockpits and detachable pod, where its speaker is located. Once the President's debt is repaid, the ship is upgraded in appearance and turns gold. The ship is presumably destroyed by the Quaggled Mireclops in Pikmin 3. The Hocotate ship can store Pikmin and treasures, and will house both White Pikmin and Purple Pikmin once they are found. Unlike the S.S. Dolphin, the leaders cannot check how many treasures have been collected using it, nor can they restore their suit's damage meter. Standing in the green light and pressing / before Purple Pikmin have been found does nothing. The ship has two cockpits, and is capable of deep space communication, sending a report each night to Hocotate and receiving mail. To do this it must be in orbit around PNF-404. The ship can dispatch a Research Pod for traveling underground. When the leaders go underground, the ship dispatches its nose cone, known as the Research Pod, and sends it down to support them. Anything that the Pikmin pick up will be carried to the Pod and stored in its hull until the player exits the cavern. On leaving a cave via a geyser, the treasure worth of these is added to the total. If the player chooses to leave by selecting the option in the pause menu, the Pod will dispose of all treasures and creatures that were collected and return to the surface with the leaders and Pikmin. This will happen automatically if all Pikmin die or both leaders suffer too much damage, and cannot be stopped without resetting the game. The discarded treasures will be returned to the sublevels they were found in. After the player pays off the debt and the ship is upgraded, a scratching noise can sometimes be heard when near the equally-upgraded research pod. The Research Pod as shown in-game. The Research Pod turns gold after the debt is repaid. When one complete "series" of treasures has been collected, the ship's sales pitches become available. This is an advertisement for the treasure as if it were a product. Closeup of the wrecked ship in Pikmin 3. In Pikmin 3, the ship makes a small appearance in the Garden of Hope, just outside where the Quaggled Mireclops is fought. It is out-of-bounds, but it can be reached by throwing leaders on a split log, then throwing a leader onto the ledge. It is heavily damaged, stuck to the ground, and missing its golden paint job. The Koppaite leaders assume that this was the Quaggled Mireclops' doing. In a nearby data file, Olimar mentions that the ship was once a top-of-the-line product, but he now dislikes it. The reason for that is a bit vague, since the data file changes between regions. In the US version, he claims the ship is an insult to his piloting, but in the European version, claims the ship actively criticises his piloting skills. The ship as seen in the Nintendo Land Plaza. In the Nintendo Land attraction Pikmin Adventure, the ship is the goal point in every level. In the plaza, there is a statue of it called The Ship. For info about the ship in the "End of Day" Final Smash, see End of Day. The ship appears in Super Smash Bros. Brawl. During the beginning of a match, Olimar enters the stage in the ship and jumps out to pluck three Pikmin. When Olimar uses his Final Smash, "End of Day", he hops in the ship while Bulborbs cause damage to his opponents. Olimar then crashes down back on the stage, sometimes further harming his opponents. In the Subspace Emissary, Olimar's ship is seen along with a number of other airborne vehicles in the attempt to enter Subspace as well as the beginning of the level Outside the Ruins. In the Great Maze section of the Emissary, it appears in the background as part of the level's scenery. The ship also appears as a trophy and a sticker. “A battered old spaceship used when Hocotate Freight first opened. Its appraisal gauge analyzed garbage Olimar brought home and found it to be valuable. With his new ship sold off to pay company debts, Louie and Olimar flew this one back to the Pikmin world to find more treasure. The ship's removable research pod accompanied the adventurers when they ventured underground. The Hocotate Bomb item in Super Smash Bros. for Nintendo 3DS and Wii U. This article or section is a short summary on the ship in the Smash series. The ship retains most of its Brawl appearances in Super Smash Bros. for Nintendo 3DS and Wii U, excluding the sticker and Subspace Emissary. In addition, it appears in Super Smash Bros. for Nintendo 3DS and Wii U and Super Smash Bros. Ultimate as an item as well. However, it is not the real ship, but rather a bomb disguised as it. When placed on the ground, it lifts off after a delay, and then drops unexpectedly, causing it to explode and damage anybody but the launcher. “With the outward appearance of a Hocotate Freight ship, this is actually a bomb in disguise! Arm it by throwing it on the ground, and give it a nudge if you're impatient. It'll fly up into the sky, returning a short time later and exploding. Force your foes into the landing zone! “The flagship of Hocotate Freight has been reinvented as...a bomb! To arm it, throw it, then wait. Or give it a nudge – up to you. It'll shoot up in the air, then after a bit, fall back down to its starting point and go off. Try to remember where it was set off – you really don't want to get caught in the blast. Super Mario Galaxy's version of the ship. Super Mario Galaxy has two planets shaped very similarly to the the Hocotate ship, one located in the Space Junk Galaxy and the other in the Ghostly Galaxy (the latter cannot be accessed). It is likewise a red, rusted color. The official name of this ship is quite the conundrum. While simply called "the ship", "my ship", "our ship" or "the Hocotate ship" in the English versions of Pikmin 2 and Pikmin 3, in the Japanese games the ship is in fact referred to as "S.S. Dolphin first model". Since the original S.S. Dolphin (ドルフィン号? and this ship (ドルフィン初号機?) both have "Dolphin" in their Japanese name, a number of errors arise. 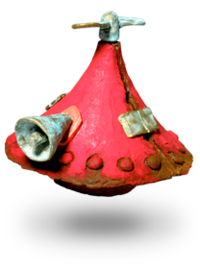 Possibly attributed to different translators unfamiliar with Pikmin or simple oversights, the Hocotate ship is sometimes called "the S.S. Dolphin" when it should be "the Hocotate ship" or "the ship". For example, in the Super Smash Bros. for Nintendo 3DS and Wii U trophy, it's stated that Olimar boards "the S.S. Dolphin" for his Final Smash, however he is in fact boarding the Hocotate ship. An interesting possible oversight is found in Pikmin 3: in the Secret Files Olimar states that he is the captain of the S.S. Dolphin – normally players would assume that he is talking about the original S.S. Dolphin from the first game, however knowing this information it becomes apparent that he could in fact be talking about this ship. This explains why in Louie's secret file he presents himself as a crew member of the S.S. Dolphin. It makes more sense to assume that Olimar is talking about being captain of the Dolphin he is currently piloting and not the one that was sold and is no longer his, and for Louie to consider himself a crew member of the only Dolphin he has boarded. However if this is true, Pikmin 3 would be the first time the Hocotate ship is referred to as "S.S. Dolphin" by the characters, mainly Olimar, possibly meaning that the way they refer to this ship was retconned in Pikmin 3. If this is the case, the mistake in the Secret Files comes from the localization's side. If they do were in fact talking about the original S.S. Dolphin then the mistake comes from the Japanese version, given that Louie has never boarded Pikmin 1's S.S. Dolphin. There are other times when the ship is referred to in Pikmin 2, but none of those end up giving it a proper name. On the manual, it is referred to as "the old ship", "your ship", "the ship", etc. On the pause menu in Pikmin 2, the numbers of stored White and Purple Pikmin are listed in a section called "Rocket". 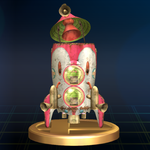 In Super Smash Bros. Brawl, a non-canon game, the trophy for the rocket calls it "Hocotate Ship", although the "S" is uppercase. Because of how hard it is to know the ship's canon name, most fans call the ship "Hocotate ship", "Hocotate Freight ship", or "the ship", depending on the game, the version, and their own preferences. 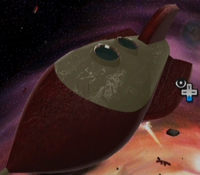 The ship is identified as "Dolphin 1" in the prototype version of Pikmin 2's script. Similarly, its internal name in Super Smash Bros. Brawl's files is Dolfin. The internal name inside Pikmin 2 and Pikmin 3's files is ufo. As a sticker in Super Smash Bros. Brawl, the vessel is referred to as "Olimar and Louie's Ship". In Super Smash Bros. for Nintendo 3DS and Wii U, the ship is made into an item, but is called "Hocotate Bomb" instead. This is naturally just the name of the item itself, and not the ship in the Pikmin games. The angel seen on the ship's side. Texture used for the angel, from Super Smash Bros. Brawl. Wallpaper of the Hocotate ship from Pikmin 2. In the ending cutscene for Pikmin 2. The ship once the debt has been repaid, shown here in the Perplexing Pool. The wrecked ship in Pikmin 3. Brittany finds the Hocotate ship in the ground in Pikmin 3. Side view of the wrecked ship. Back view of the wrecked ship. Captain Olimar walks into the Hocotate ship in Super Smash Bros. Brawl. The ship flies off in Super Smash Bros. Brawl, as part of Olimar's Final Smash. The sofa and television inside of the co-pilot's cockpit. The TV's texture is animated. Texture used for the holographic panel when a leader gets close. The trophy in Super Smash Bros. for Wii U lists Pikmin as one of the games the ship appeared in, which is incorrect – it made its debut in Pikmin 2. The co-pilot's cockpit in the golden version of the ship has a sofa and a television for the President. This can be barely seen by manipulating the camera. That said, its screen pulsates between a dark shade and a strong cyan, but this effect cannot be seen from the glass due to the way the game is rendered. By moving the camera inside, for instance, with an emulator, one can see the pulsating effect in action. This article was a featured article from August 29th to October 10th, 2008. This page was last edited on April 22, 2019, at 17:47.